The key to pitching is having a strong arm. By building arm strength not only can you add miles per hour to your fastball but you will have the stamina to pitch deeper into games and be less likely to suffer an injury while on the mound. Here are four exercises that should help any pitcher develop good arm strength. 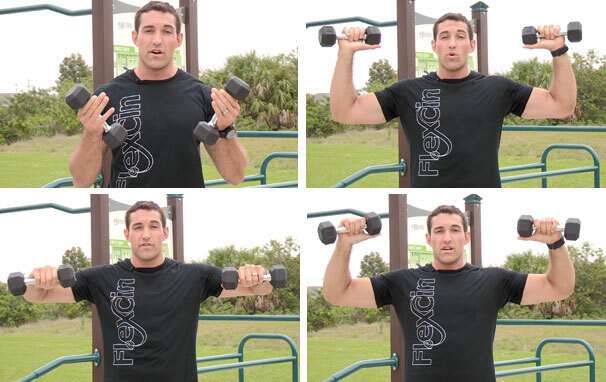 You use a four pound dumbbell for this exercise. With the dumbbell in your pitching hand stand with your hands to your sides and your thumbs out. While keeping your elbow straight raise your arm to shoulder height — which makes a 45 degree angle. Then with the elbow still straight slowly lower the arm back to your said on a three second count. This deceleration on the way down mimics the deceleration that takes place when you throw a baseball and strengthens the rotator cuff for this motion. Do three sets of ten with three second pauses between each. Do not do more than one session during a 24 hour period. This exercise is simple enough. Buy a resistance band, which is just a giant rubber band. 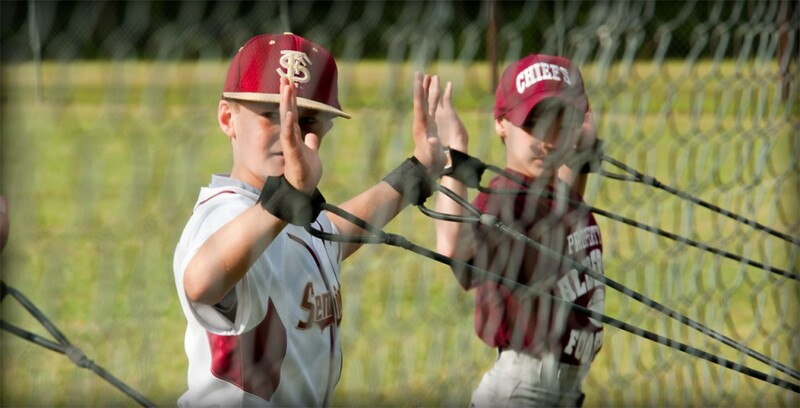 The D2 flexion is a resistance band that works well for pitching arm strength drills. Now stand up with one side of the resistance band in your hand and the other attached the floor a few feet in front of you. The key is to position the band in a way that it provides resistance. Raise your hand to your side repeatedly, strengthening all the muscles that are used when you throw a baseball. Long Toss is an oldy but a goodie. 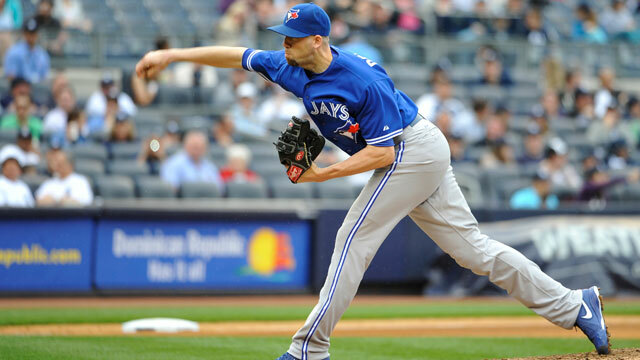 Just about every Major League pitcher long tosses, and some will do it up to 300 feet. 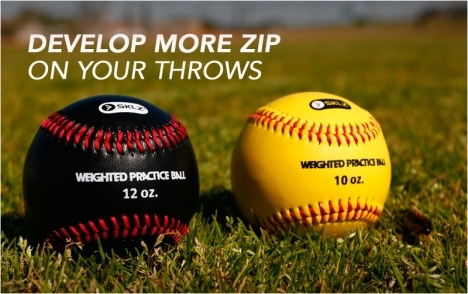 Now Little League or High School pitcher doesn’t have to throw that far to benefit from long tossing. To get the most out of long toss program you should start by doing a light catch. Then throw at 60 feet for four minutes. Up that to 90 feet for three minutes. Next 120 feet for 2 minutes and after that see if you can get up to 180 for a couple minutes. Finally cool down at 45 foot for a minute. During the long toss, try to throw with as little arc as possible. If you have to bounce it at first that’s OK, but don’t move in. The youth pitcher should try to long toss about 175 days a year to maintain arm strength. Weighted balls is another classic way to increase arm strength. While a regular baseball weighs 5.25 ounces weighted balls come between 7 and 12 ounces. 7 ounces should be used for Little Leaguers, 12 ounces for college players and those in between for the ages in between. A typical weighted ball drill would be to throw 15 pitches with a weighted ball from about 50 feet with your back leg back, every other throw as hard as you can. Then ten pitches with regular ball from that distance and with your back leg back, again alternating between a hard regular thow. Next ten more with the weighted ball using the same technique and finally ten pitches with a regular ball but this time with your back leg in a more regular position.